You are a bridesmaid or maybe even a maid of honour, what’s next? The bride gets to choose what you wear on her special day. It is acceptable for bridesmaids to wear different dresses, but their gown preferably should be in one color palette and made of the same fabric. The bride selects the colour scheme for the wedding and might want the colour of bridesmaids’ dresses to coordinate with bridal bouquet, the decorations or sometimes even with ties of male guests. It is great when the bridesmaids are happy with the bride’s choice and can’t wait to wear the dresses she selected for them, but it often happens that some of the friends feel that colour or style of the dress doesn’t flatter her much. If this happens to you, think twice before commenting on the bride’s ideas. She has a lot on her mind these days, don’t multiply her list of things to worry about. We suggest voicing your concerns only in case when you feel it’s extremely critical for you not to wear the dress bride is asking you to put on. The bride on the other hand should try to be as considerate as possible. In terms of style, probably the least problematic are the dresses with A-line skirts and empire waist. Those usually look good on different body shapes and sizes. Colour is also very important. When choosing, think about your bridesmaids complexion and hair color. Be kind and avoid something that you know your friend would never put on if it would be up to her. In general bright, dark coloured gowns (black, hunter green, navy) look good on most of women and can be used for other formal events later on. 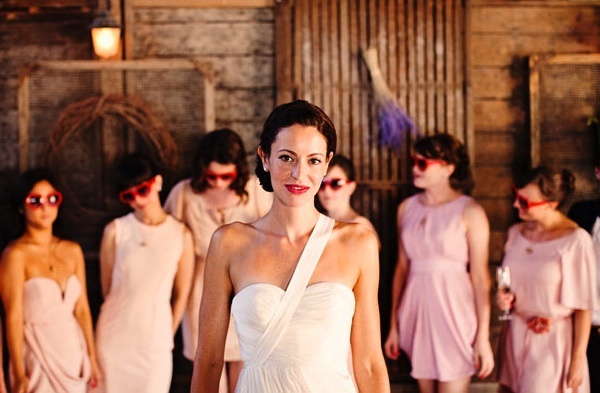 If the bride wants her bridesmaids go with strapless dresses she has to check specifically whether every maid would be absolutely comfortable wearing it. It is a good idea to pick only the colour and the fabric and let bridesmaids to decide how do they want to style their dresses. What looks good on your petite college friend can be a major fashion disaster for your healthy-sized cousin. The bridesmaids dresses should usually stay in $100-300 range. If a bride found something more expensive than that and does want the bridesmaids to wear it whatever it takes, she should cover the difference. Most probably the bride will have a lot on her plate besides the outfit for her bridesmaids. She might want to ask her maid of honor to be in charge of organizing bridesmaids gown purchase. Do you have questions about Bridesmaids Dresses or you think we forgot to mention something important? Come talk to us! Leave your comment below!